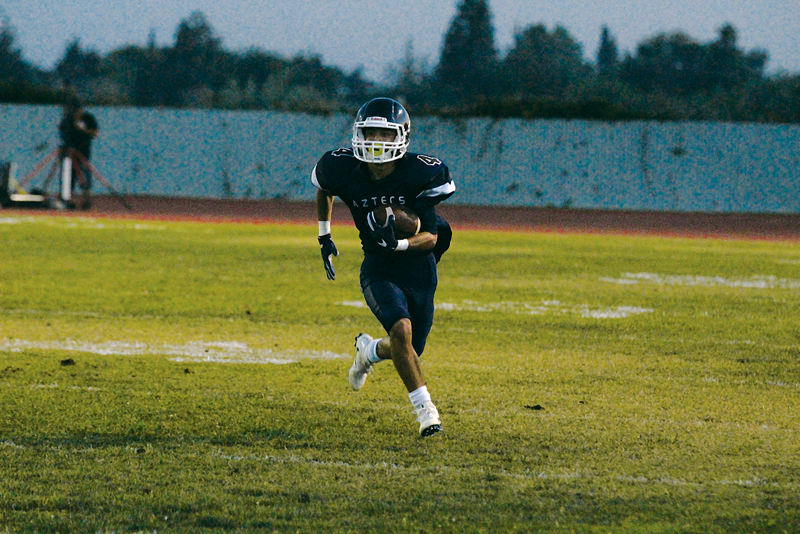 FARMERSVILLE – Victor Castrejon had always known achieving his dream of playing football at the next level would be difficult. As he attended camps, and competitions over the years he realized his 5-foot-8 frame for a receiver was not greatly sought after by college scouts. Worse yet a childhood accident left him blind in his left eye greatly effecting his depth perception. Although, difficult he never deemed it impossible and continued to train and compete hoping that one school out there needed his abilities. As luck would have it Ohio Northern University offered him a partial scholarship. “If you really believe you can do something to pursue your dream and have great success doing it,” Castrejon said. While at Farmersville Castrejon was a two sport athlete performing just as well on the hardwood as on the gridiron. The decision to continue his football career over basketball came down to college interest. Five universities besides Ohio Northern showed interest but most of his basketball interest came from junior colleges. “I thought it would be better for me to get to a four year and continue to play a sport I love,” Castrejon said. At first Castrejon’s future coaches wanted to try him out at defensive back. While familiar with the position his heart was set on playing slot receiver. The position he played during his junior season where he amassed 59 catches for 1,133 yards and 17 touchdowns. One year later his speed was used at quarterback in a spread offense, and for the second year in a row he surpassed the 1,000 yard mark. Raised in a one high school town where everyone supports the sports teams was another factor which played into Castrejons decision on choosing Ohio Northern. Located in Ada, Ohio where the population is 5,952 people it had the same atmosphere as Farmersville. Castrejon plans on majoring in sociology. After school he plans on returning to Farmersville to work as a high school counselor. When the class of 2018 walked across to receive their diplomas last Thursday night Castrejon was not the only one destined to play football at the next level. Donovan Minton, and Skylar Morris will be playing on Saturdays as well. Minton will head to Linfield College in McMinnville, Oregon. Originally the plan was to remain close to home. Attending college and playing football for a school in California, but none of the schools that recruited him had a nursing major. That was when he was forced to look outside the state line, and once he visited the campus he knew it was the right fit. “I really wanted to continue my career there,” Minton said. For Minton there will be no adjustment period. After four of the Wildcats defensive ends graduated last season he will look to compete for a starting job right away. Currently the Wildcats are ranked seventh in the nation at D-III and coming off a 9-2 record winning the Northwest Conference. Minton had impacts on both sides of the ball for Farmersville during his senior season but he made his largest strides on defense. Controlling the end of the defensive line he was third on the team in tackles with 55. At tight end he hauled in 21 catches for 331 yards and two scores. As for Morris he will be the only one headed to Junior College and remain in California. He will attend Feather River College in Quincy, Calif. Morris was heavily recruited by junior colleges including, Reedley and Fresno City Colleges. The decision to choose to compete for the Golden Eagles came down to the coaching staff. Their bluntness and the environment they produced were selling points. “I really liked how everyone was a family,” Morris said. During Morris’ senior season he was the main target for Castrejon. He hauled in 53 catches for 773 yards and eight touchdowns.